Have you ever heard about Medium.com? I reckon as yes because it is one of the best platforms currently for writers and readers. It is a social community designed for those who find difficult to create a blogging website. It gives you medium, a platform and a stage to express yourself where an entire community is present to hear you out.With the help of WordPress development services, you can easily have Medium-like website to share content and build a community. The website has so many features that are eye catching and very innovative. These features are the first thing we will be discussing in this article. 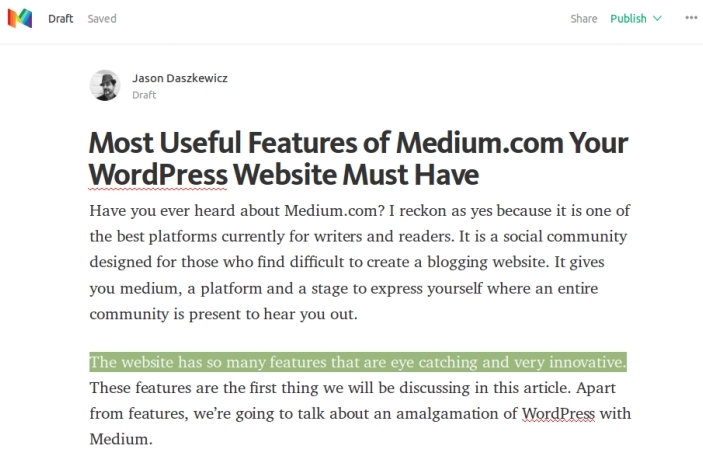 Apart from features, we’re going to talk about an amalgamation of WordPress with Medium. You must have read many articles about the comparison of WordPress and Medium. However, my personal views are quite different. Comparing a Content Management System with an all around content publishing platform is quite an injustice. In my opinion, in spite of comparing these two, we should find some ways to integrate these two great content platforms. Want to earn money through blogging? Get Started now with FREE Consultation! There are so many things you might not know about Medium. 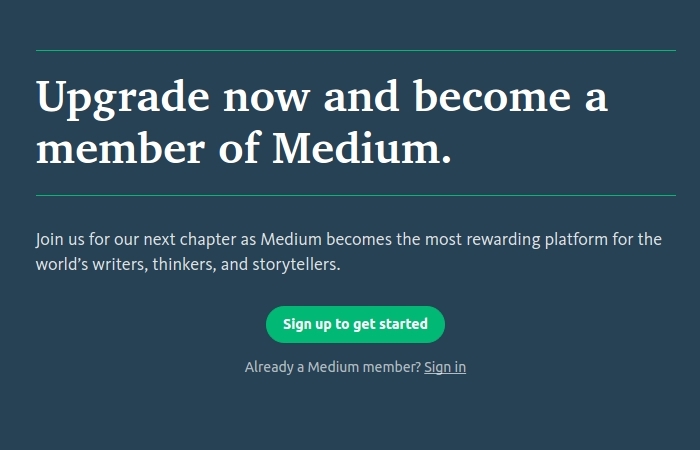 In this section, We’ll discuss the introductory part of Medium. We will also be unfolding the feature list and brownie points of Medium but before that let’s see some untouched tenets of Medium. 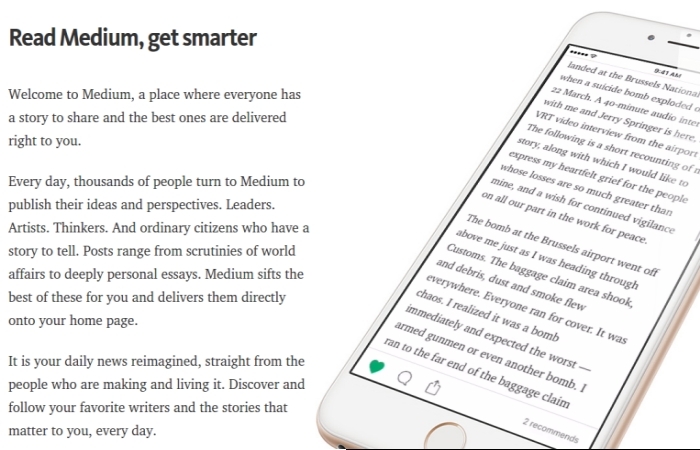 The irony is Medium was best defined by Medium’s team. Have look on the quote given by their own team to define their organization. The world has reached a saturation point of shallow, thoughtless content, and half-skimming through these pages of filler is increasingly unfulfilling. Every day, your Medium homepage is full of stories with depth and meaning—stories that make you laugh, cry, and actually feel things. This is the best description of Medium. It is a platform that provides a voice to the voiceless; power to the weakest and most of all this platform provide your messages the meaning and the context it was missing (Wow, I can write quotes huh!). The medium was founded by Twitter co-founder Ev Williams and Biz Stone in August 2012 as a blog-publishing platform to provide writers and readers the exact thing they need in one place which is “CONTENT”. Now, this blog-publishing platform is now evolving to a community of writers and readers. There was a downfall in this community later this year as they fired one-third of their employees, But then things changed when they decided to change it as a membership website. However, you can still join it for free but to get access to the premium content you have to pay a small monthly fee of $5 per month. Honestly, it’s worth a shot if you have a knack for reading the highly engaging title. It is one of the brownie point of medium which makes it more important to add on your WordPress website as well. It enable your reader to create their own posts which anyone can read. In addition to that, you should provide them sufficient amount of customization element. This is where a WordPress website is an ideal solution for that. As a matter of fact, medium have a very decent editor, with general customization features such as post editor, add image feature, embed videos, and preview option. So, the bottom line is medium do not have any html tagging. So, as a WordPress website owner you can easily add html tags which can make your WordPress website’s editor better than medium. This is not just about the post but the presentation of the post. This brings us to the final point, which is Medium is now, started being recognized as a publication. As it provide so many interactive features for not just readers but also writers. You can present your content effectively, so does your readers. This is the reason medium is growing as a publication medium. However, using WordPress can actually bring a sure shot plus point. You can definitely make your WordPress website better if you plan it well. A free membership section for all the readers/writers with certain restriction. A paid membership section for those members which agreed to pay a monthly payment. What can you do as a paid member? You get access to all kind of content including the premium high-quality content and the audio files of the posts (We’ll cover that later.). When you entered the website, there are so many things inside it and you don’t have any idea what to do. Medium.com provides you the option to select content categories of your interest and then have a well-organized start to your Medium experience. A thumbnail presentation is very cool and very trending nowadays. However, it covers a lot of space but it is very striking as it gives a glimpse of what your reader will read in the post. This is not unique to medium but it is still one of the prime features. You can also use certain themes to automatically add post thumbnail to your WordPress website. This is the best feature according to my liking. There are many websites that usually have menu items divided into categories which in general very simple to make. But Medium takes another creative approach and divided its customs posts into categories and declutter the website in such a beautiful way that simply defines “Less is more”. This is a very creative approach by bloggers which is trending nowadays. When you see a title of the post, you might wonder how long is it and how much time it would take to read that. This feature cancels all these questions. It is quite the thing for those TLTR folks (Too Long To Read). 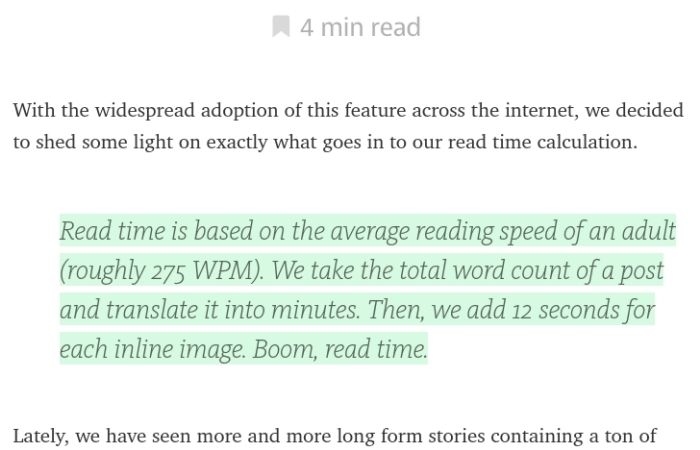 Every post of Medium.com shows the estimated time to read. Their assumption is an average adult reader will take 275 words per minute to read. You can use these plugins to add a small section which will show you the estimated reading time of your post. You can also customize the average reading time per minute in accordance with your preferences. This is very crucial for all kind of websites. Medium.com also provides an interactive search box with custom filters. These filters avail the members to create a search criterion of their own which helps them to narrow it down if they don’t know the title exactly. 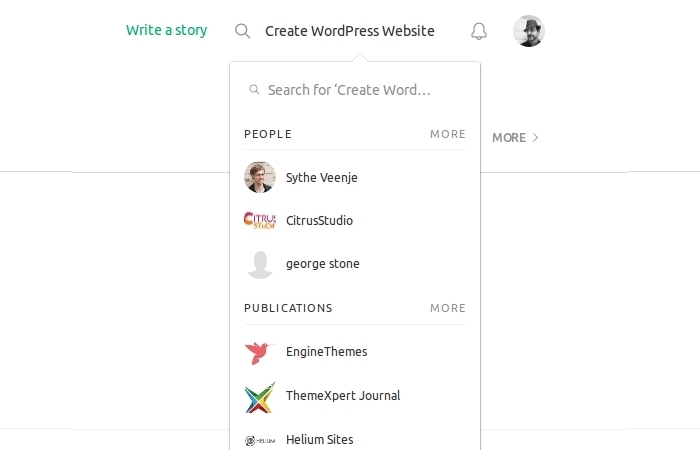 When you’re creating a website like Medium with WordPress, you can use these plugins for creating an interactive search box. So, with these plugins, you can also add an interactive search box for your WordPress website. This is another very interactive feature by Medium.com. This feature allows the reader to keep track of the exhaustive newsfeed that continuously might pop up and declutter your dashboard. You don’t face such problem with Medium.com. All your preferences are quietly and elegantly put up in your dashboard and your reader can easily access them without wondering where the latest one was gone. 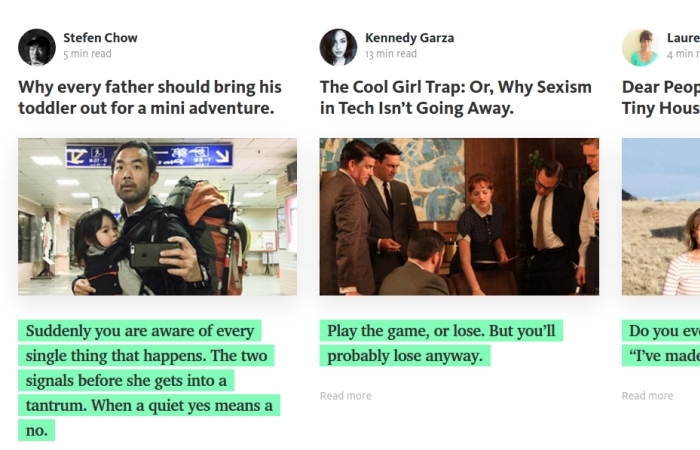 While reading any post in medium.com, you can comment and share specific lines on social media. This is a very interactive feature. You might want to have a look on to this specific attribute. If someone likes quotes or any of your single line, he can select it and then comment on that specific line in your post. 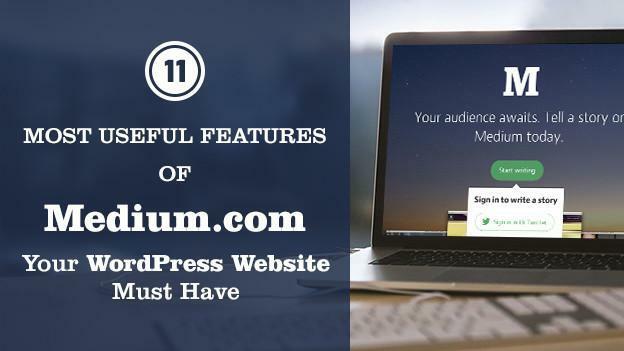 You can use these plugins to add this medium like feature to your WordPress website. Now, that is the unique feature of medium.com. You can listen to every post on medium.com. If you’re tired of reading lengthy posts, and you’re a premium member of the medium.com, you can simply listen to the audio version of the post. This is a crispy new feature in market and medium is voraciously using it. I am not sure if there is any plugin available for such advance version. You have to first record the entire audio of the post and then embed it with your post in WordPress. 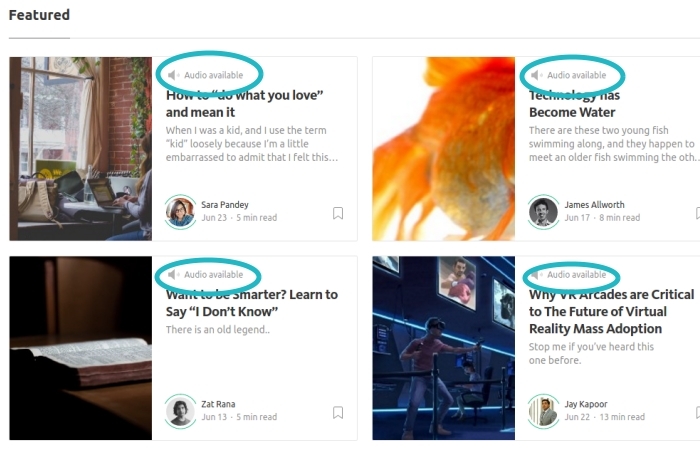 This is how Medium.com also get the audio posts for almost all of their premium posts. This feature has made medium by far the best platform to share contents. Enable Members to Create a Story of their Own. Free and Paid Membership Feature. Allow the Members to Select and Organize Content Preferences. The Thumbnail Representation of Posts with a Small Summary. Display Categories Sorted by the Members. Add a Search Box with Custom Filters. Provide a Reading List According to the Reader Preferences. Allow Members to Share Specific Lines of the Post. Audio of Posts for Premium Members. I hope you like my post. Share it to spread the word. Till then have a good day.